Just a day after a FTOPS Gold Jersey was sold on EBay for the sum of $250, yet another piece of poker history appeared on the online auction house’s website: a 2006 World Series of Poker Circuit Ring that was awarded in San Diego, California. Last year we saw Peter Eastgate auction off his 2008 WSOP Main Event bracelet for a huge sum –some $170k—that he donated to the Children’s charity UNICEF, followed by a rush of lesser known bracelets making their way to EBay, with the likes of Eskimo Clark and Brad Daugherty trying to sell their WSOP trinkets with varied success. There is no word yet on who the seller of the WSOP Circuit Ring is at this point. Aside from the Eastgate bracelet there hasn’t been a piece of poker memorabilia that has caught collectors’ fancy as most of the other items have sold for about their weight in Gold. While I have no idea what the WSOP Circuit ring is worth based on its gold content, my guess it is roughly the starting bid of $2,000 –which has been placed—which would seem about right considering the WSOP bracelets had a gold value of around $5,500. 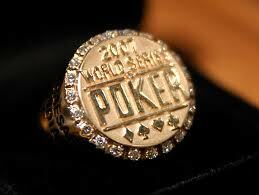 World Series of Poker 2006 Circuit Event Ring !! This was won in San Diego in 2006 at the WSOP Circuit Event ! Lifetime chance since these rings are not usually found. This entry was posted on Saturday, April 9th, 2011 at 11:58 am and is filed under Poker News. You can follow any responses to this entry through the RSS 2.0 feed. You can leave a response, or trackback from your own site.